Here’s my list of ten best places to visit in Zimbabwe. Do you know what strikes me about this list? The landscapes are all so varied. From the rainforest at Victoria Falls, to the rocky vistas at Matobo National Park, to the misty hills of Nyanga, one thing is for sure: there’s too much to see in just one holiday. The largest waterfall in the world (when accounting for both width and height) should clearly be at the top of everyone’s travel bucket list. There is no substitute for seeing this thundering, frothing, life-affirming natural wonder in person. Victoria Falls is on the border of the two countries of Zambia and Zimbabwe, but 90% of the viewing points are in Zimbabwe (just sayin’). While you’re there, the town of Victoria Falls (which is, yes, in Zimbabwe) has so much to do that you should stay here at least three days to enjoy it fully. There’s white-water rafting, bungee jumping, Big Five safaris, helicopter rides, river cruises, local village visits, steam trains and so much more, set in exceptionally beautiful surrounds. Read my Victoria Falls travel guide. Kariba is one of my personal happy places. It’s the world’s largest man-made lake (by volume) and its dam wall is an Italian-designed feat of engineering. While that’s very impressive and all, you’ll visit this area for its extraordinary natural beauty and prolific wildlife. The mountain-edged area around the lake is home to the Big Five, as well as numerous other bird and animal species. I recommend you rent a houseboat and enjoy home-comforts whilst travelling to different parts of the lake. Alternatively, stay at a safari lodge or self-catering accommodation on one of the peninsulas or islands of Kariba. Wherever you go along the lake, one thing is guaranteed: your view will be accented by petrified trees jutting into the skyline and elephants wallowing in sunset-hued waters. Read more posts about Lake Kariba. Located along the forested floodplains of the Zambezi River in north-eastern Zimbabwe, this UNESCO World Heritage Site is one of Africa’s last unspoilt wildernesses. Perhaps not as easily accessible for tourists as Hwange National Park, there are many pros for visiting Mana Pools: prolific wildlife, scenic vistas of the Zambezi River, undergrowth-free forests, and fewer tourists. Many seasoned safari experts regard Mana Pools as the epitome of authentic game viewing in Africa, as well as one of the top locations for walking safaris and canoe safaris. You can self-drive, or stay in a guide-led lodge, both of which allow for numerous opportunities to live at close quarters with elephant, hyena, lion and hippo. Read more posts about Mana Pools. In this unique landscape of balancing rock formations and granite hills, rhinos can be found meandering through the vegetation, whilst eagles soar overhead. The caves here have been inhabited my man for thousands of years, leaving a legacy of rock paintings and legends for future generations. The spiritual atmosphere of Matobo National Park is felt by even the most world-weary of visitors, and you shouldn’t overlook it in your visit to Zimbabwe. The nearby city of Bulawayo is also a historical icon; read posts about Matopos and Bulawayo. For centuries, the structures at Great Zimbabwe have captured the imagination of locals and explorers alike. They’re the largest, and second-oldest of their kind in sub-Saharan Africa. The local name for the site was “Dzimba dza mabwe” (roughly “Houses of Stone”) or simply “Zimbabwe”. These ruins are so important that when Rhodesia became independent in 1980, the nation itself was named after them. In addition, the soapstone bird carvings found at the Great Zimbabwe site have become the nation’s emblem, and are a central feature on the country’s flag. This, along with the size and scope of the ruins, makes the Monument a fascinating and insightful place to visit. Read my Great Zimbabwe Monument & Ruins travel guide. Roughly the same size as the Serengeti National Park or the state of Connecticut, Hwange is home to one of the largest elephant populations on earth. This may sound trite, but when you see a 200-strong family of elephants just footsteps before you, without any fences, bullhooks or ‘handlers’ in sight, the term ‘wild’ will take on a whole new meaning. Not only that, but there are lion (it was home to the now-famous Cecil), giraffe, cheetah, African wild dogs, and over 400 species of birds, all of which make this a wildlife-viewing paradise. Due to Hwange’s easy access from Victoria Falls and Bulawayo, and a wide range of accommodation options, this is the perfect place both for first-time safari-goers as well as seasoned bush lovers. Read more posts about Hwange National Park. The capital, Harare, is where I was brought up, and it has more going for it than first meets the eye. It has art galleries and historical relics, wildlife sanctuaries and natural beauty. It’s home to ladies-who-lunch and politicians, accountants and technology whizzes; gardeners and doctors. You’ll see cyclists carrying firewood on their heads, “emergency taxis” weaving crazily along pot-holed roads, and street vendors selling flags at traffic lights. The street lights often don’t work, yet certain suburban houses with generators will be illuminated from every square foot. The cars range from brand-new Hummers to dilapidated VW Beetles. The city centre can look tired and brash, yet the north-eastern suburbs are spacious and beautiful. Harare is the perfect mish-mash of contradictions to introduce you to Zimbabwe before heading into the bush. As much as I want you to experience Zimbabwe’s game parks and natural wonders, I think it’s equally important to embrace the country’s cities and towns, to understand the whole picture. Read my Harare, Zimbabwe travel guide. This National Park is famed for its dramatic red sandstone cliffs, jutting into the sky as if they were sealing the edge of the known world. The elephants here have a reputation for being larger and less tolerant of humans than elsewhere in the country, due to a historical conflict between hunters, local communities and authorities. More recently, innovative projects have gone a long way in improving relationships with the local people and easing human-wildlife conflict. There are two luxury lodges in this area, both of which are highly attuned to sustainable community development and conservation. In addition, there are self-catering lodges and ‘undeveloped’ campsites for anyone wanting to truly go back to basics. Game-viewing is less prolific and temperatures can be high, but this only adds to the feeling of being in a lost world, isolated from modern distractions. The rewards are many: you’ll have the chance to see rhino, wild dog, long-tusked elephant and rare king cheetah, without another human being for miles. This lush, mountainous forest is a complete contrast to the savannah ecosystems seen elsewhere in Zimbabwe, confronting many people’s preconceptions about ‘typical’ African scenery. Vumba is a small but photogenic reserve, offering exciting walking trails and mist-hued views into the neighbouring country of Mozambique. It’s one of the few places in Zimbabwe where you can see forest-dwelling samango monkeys (as opposed to widespread vervet monkeys) and rare bird species such as the jackal buzzard − all in a fairytale-like, Lord of the Rings-style location. There are a number of picturesque lodges and hotels in the area, as well as coffee plantations, an infamous coffee shop, a golf course and enchanting botanical gardens. If you were teleported to Nyanga, you’d be forgiven for assuming that you were in the highlands of Scotland. Swelling hills, pleasantly gurgling rivers, mountain waterfalls, and green valleys greet visitors: all this barely three hours from Harare. 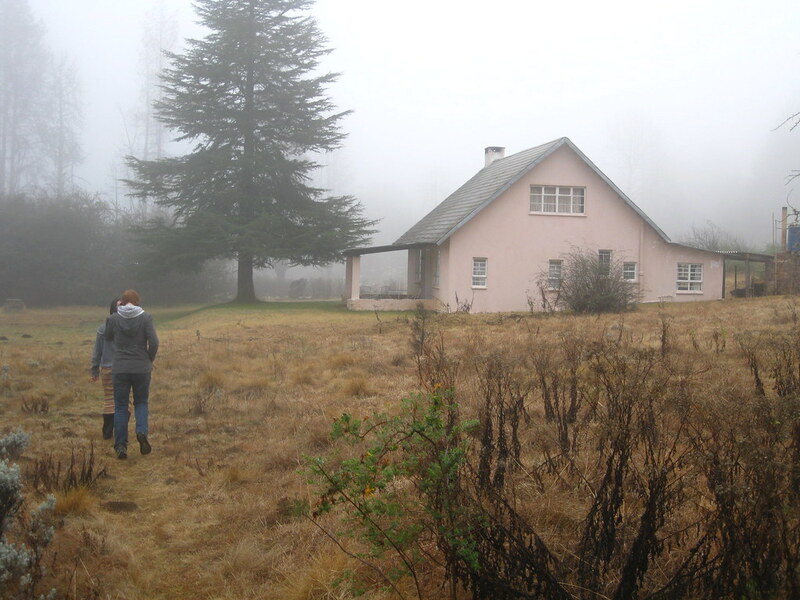 Nyanga is not the place to see the Big Five (although there are smaller species); it’s the place for snuggling next to a fire in a cosy cottage, walking along fern-lined mountain paths, and going wild swimming in sparkling waterfalls. Your friends will never believe that your photos were taken in Africa. Be part of the movement that breaks those narrow stereotypes. What do you think? Do you have a #1 favourite place to visit in Zimbabwe? Zimbabwe’s politics and economy have been covered in the media for a number of years but there is so much more to this country. Zimbabwe has an abundance of life-affirming travel opportunities for those who take a closer look: world-class wildlife, vast wildernesses, and friendly people who are proud of Zimbabwe’s treasures. (Corny as that may sound, it’s true.) My aim for the blog is to showcase the positive aspects of Zimbabwe to the world, while providing useful and honest information for anyone interested in travelling here. Zimbabwe has the best naional parks and Victoria falls is a must visit place there. I would put the Chimanimani mountains before the city of Harare !!! Zimbabwe, oh the memories I have gathered there… And thumbs up for the top-10! We did quite a few of them three years ago. I’ll never forget the houseboat trip we made with http://www.karibahouseboats.com/ It’s like driving your boat through a BBC nature documentary, the only thing that’s missing is the voice over of David Attenborrough. We spent a few days cruising around the lake and fishing for the great tiger fish (easier to hook then to land! ), enjoying every moment of this. Highly recommend to make the same trip on Lake Kariba. And if you to make the houseboat experience we topped our trip of with a short visit to Amsterdam (https://www.bookahouseboat.com/rentals/amsterdam) just before heading back to the UK. Nice change of scenery, unforgettable holiday!